I recently got to work on another of the Sony VFET line of integrated amplifiers, the Sony TA-5650. I’ve had one through the shop previously, and this one came in for the same service. It came in running fine – although not without a little room for improvement in the bass – and the owner wanted it overhauled to make sure it’ll serve trouble-free for many more years. These Sony VFET amplifiers are very well-regarded, and are quite uncommon. Sony only used VFETs in a small handful of models as they were a very experimental design, and only for one or two model years. They also have a known fault which crops up after a few decades: the varactor diodes used in the bias circuit go bad, removing the output device’s bias and burning them up. The only replacement for new VFETs is another amplifier – so it’s important to make sure that doesn’t happen! This particular unit was all original – except for a nice surprise! Someone had been in here previously and already replaced the VD-1221 diodes each with a pair of 1N4148s in series! Looking good! Time for performance testing. I measured the distortion below 0.1% THD at 1 kHz through most of the range, and under o.06% THD through normal listening volumes – but after the re-cap and adjustment, we’re measuring a little bit lower. Nice! This Sony then went on the shelf for burn-in testing. I listened for about a dozen hours and worked all the controls and settings to ensure correct operation. Fully checked out and verified, this Sony is ready to go home! 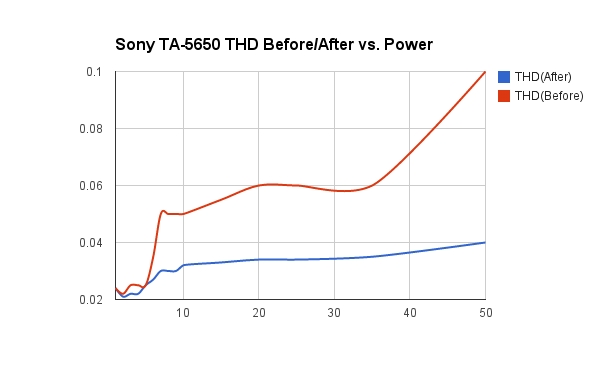 With this service, this Sony TA-5650 integrated amplifier is going to last for a long time and sound fantastic. Another piece of hi-fi history preserved for the future! If your Sony needs some service, Rain City Audio can help. This entry was posted in Audio, Electronics, Projects, Vintage and tagged 1n4148, bias, diode, hi-fi, integrated amplifier, refurbishment, Sony, TA-5650, vd-1221, VFET, vintage. Bookmark the permalink.